We are often fascinated by the story of who our parents were before they had children since it is essentially how we came to exist. It helps us understand the lives of the most influential people in your life, and it guides us in our own quest for love and self definition. 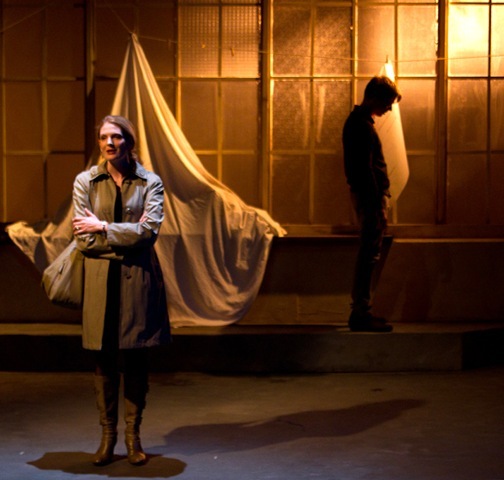 This idea played a large role in Backstage Theatre Company’s Memory, their impressive first play of their season. Other times these stories, as is the case in Richard Greenberg’s Three Days of Rain (known to many theatergoers as the play Julia Roberts flatly debuted in on Broadway), can be a great mystery to obsess upon for years. The overriding mystery is what binds six fascinating characters together played by three actors. Artistic Director Matthew Reeder’s direction in this Backstage production is strikingly human, intimate and traipses through these characters’ lives like a lone jazz trumpet traveling through time accompanied by well-suited recordings of Miles Davis doing the real thing. In present day downtown Manhattan (or maybe more so the mid-90’s if you really do the math on years referenced) we meet Walker (John Henry Roberts) in a sparse spacious apartment. He is intellectual, searching and a narcissist. After disappearing in Italy his family had thought him dead. More specifically, his sister Nan (Rebekah Ward-Hays) and his old friend Pip (Tony Bozzuto) thought so. Upon finding his recently deceased father’s journal, Walker attempts to decipher the cryptic seemingly commonplace entries. Walker believes that his parents “married because by 1960 they had reached a certain age and they were the last ones left in the room.” Nan struggles with Walker’s return and his obsession with their father’s journal. Pip, a soap-opera star, has history with Nan, and Walker was – or still is – in love with him, causing interesting tension when any combination of the three of them is on stage. Walker and Nan’s father Ned (also played by Roberts) was a great architect, or at least built one impressive house. Pip is the son of their father’s partner, Theo. In the second act Bozzuto, Roberts and Ward-Hays all take on the roles of their parents in the 1960’s. Greenberg’s writing is smart in how it takes certain words or phrases you hear in the first act and sprinkles them in the second act, showing you the roots of these ultimately poetic characters in linguistic parallels. We bear witness to all that Walker, Nan and Pip could not possibly know even if the stories were retold or handed down. They would have changed as all stories do through the course of history. Nevertheless, a few small words which Ned (Walker and Nan’s father) writes down carries all the weight in the world for each character involved in this play. Even if the meaning of those words died with Ned, they still have impacted the lives of these people profoundly whether the truth is known or not. The performances of these six difficult characters to play are worthy. The hurdle is portraying two different characters that are clueless to what the other knows and yet finding the connection between them. John Henry Roberts was stiff at times on opening night and hit an occasional false note as Walker at first, but he eventually relaxed into the role and became fascinating during the ritual that ends the act. 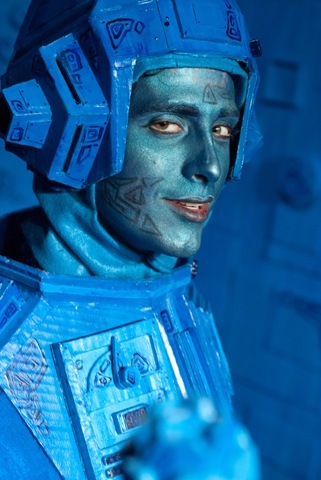 As Walker’s father, Ned, he brings a very different character to the stage that is vivacious and electric to watch. Ward-Hays is magnificent in her balance of anger and love as Nan, and then in her dreamier and more sexually charged performance as Lina. Bozzuto is dynamic displaying an exciting capability for detailed physical choices. 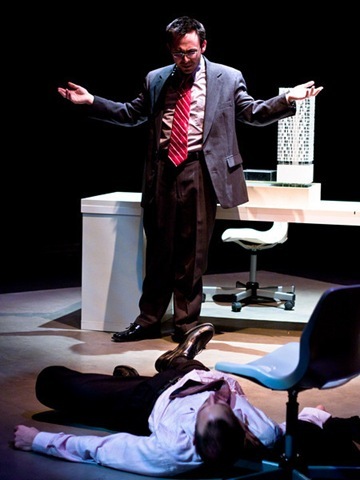 Reeder makes a brilliant choice opening the second act by allowing the characters of Theo and Ned to spend the first couple minutes transforming the space in front of our eyes, bringing life into the abandoned apartment and turning it into an invigorating Manhattan architectural workspace of the 1960’s. It’s the same apartment as in the first act, but the makeover of the room is akin to time travel. Brandon Wardell’s set fills the Viaduct space perfectly, and his lighting on the windows does wonders to create the ambiance of the physical and emotional setting. Greenberg’s non-linear storytelling is thought-provoking as only we, the audience, know the true gravitas of the words, “Three days of rain,” which Ned enters into his journal. However, perhaps this is the nature of history; it can never be retold exactly, nor needs to be. Walker and Nan come to their own necessary closure with their parents’ ambiguous history, and their father took his memories to the grave. 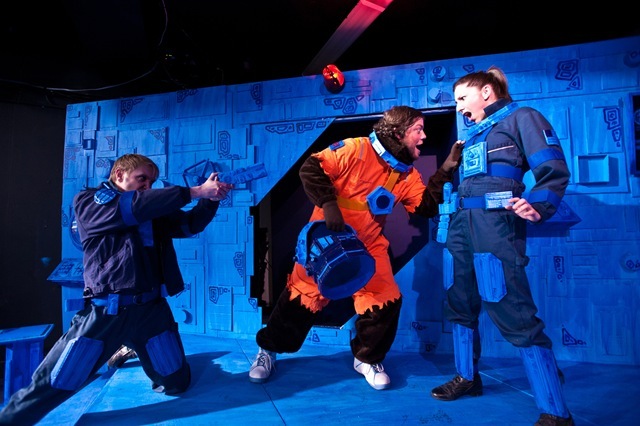 What’s clear is that Backstage Theatre Company continues to excel in creating memories for theatergoers that are definitely unforgettable. Performances for Three Days of Rain run every Thursday through Saturday at 7 p.m. and every Sunday at 3 p.m., from May 20th through June 25th. No performance June 16th, added performance Monday, June 6th at 7:00 p.m. General admission tickets are $25, senior tickets are $22, and student tickets (with a valid ID) are $10. Group rates are available. Tickets are available through the Viaduct Theatre by phone, (773) 296-6024. 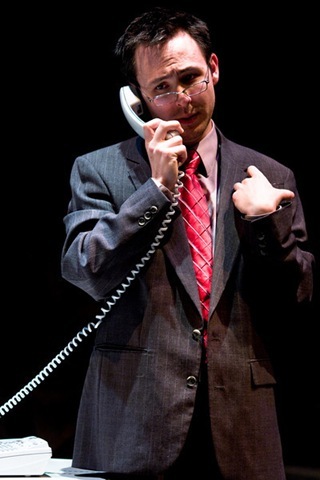 For more information about BackStage Theatre Company and Three Days of Rain, visit www.backstagetheatrecompany.org. War is hell. Especially when you’re talking about the Holocaust, an event so horrific in nature that it still rocks people to this day. Or, more recently, this hostility and violence has manifested itself in the Israeli and Palestinian War. 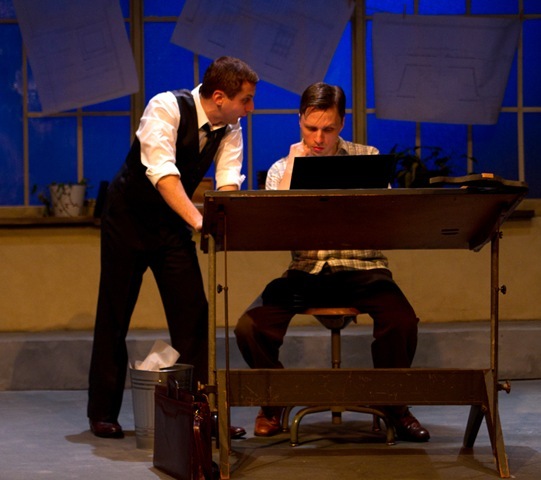 Views on these two wars are brought together in the Backstage Theatre Company’s Chicago premiere of Memory by Jonathan Lichtenstein. The set, designed by Heath Hays, starts out as an essentially bare stage: an open space, with some propped-up backward-facing set wall pieces, a piano and a couch. This arrangement leaves plenty of room for the actor’s to move around the space, both physically and emotionally. As the show progresses, the wall pieces are turned around one-by-one to reveal large-scale black-and-white photos that create background scenery that adds to the story. 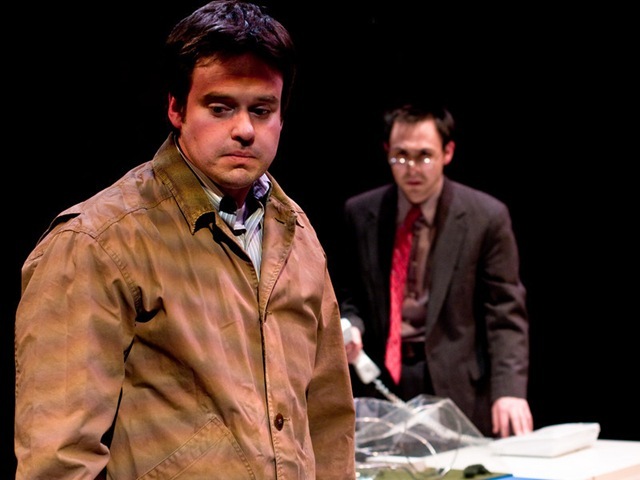 Memory – featuring Brenda Barrie, Tony Bozzuto, Samuel Buti, Bilal Dardai, Josh Hambrock, Shane Michael Murphy and Patrick De Nicola – is a show about actors rehearsing a play that turns into an actual performance of the play. The show opens on a rehearsal, with the actors all playing themselves, entering and preparing themselves for work. There is no official start to the show in the traditional sense where lights dim and actors take their places. Instead the action just begins, which is slightly confusing, causing one to question what exactly we are watching. Once it becomes clear that the show has in fact started, the action is (intentionally) a bit stressed and scattered. 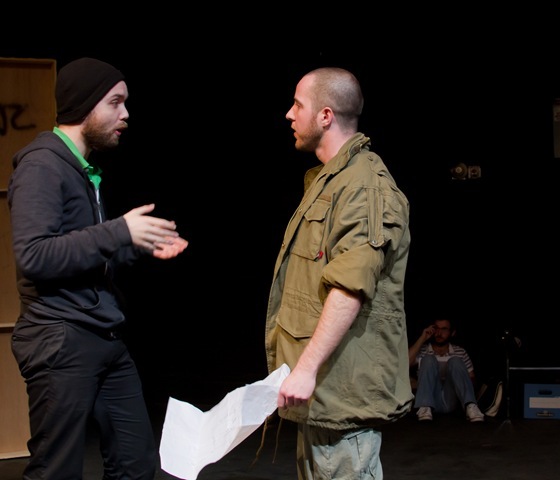 The actors begin to rehearse a scene with their director (Josh Hambrock), moving the scene forward and then stopping it, causing a disconnect between the actors and their characters. Eventually the rehearsal format falls away and a steady performance begins. Each actor morphs from performing a role and reciting lines to becoming the character and fully bringing them to life. The show is split between two stories: the story of Eva and the story of Bashar. Eva’s (Brenda Barrie) story revolves around her long-lost grandson (Shane Michael Murphy) questioning the validity of a long-standing family legend about the Holocaust. It’s told through flashbacks of Eva’s life with her friends Felix (Patrick De Nicola) and Aron (Tony Bozzuto), who later becomes her husband. Bashar’s (Bilal Dardai) story tells of his experience as a Palastinian fighting against an Israeli soldier (Samuel Buti). Memory proves to be a true ensemble piece, with each actor working in sync with one another. It’s apparent that this cast has come together and bonded, with each member as strong as the next, growing as the show progresses and developing honest portrayals of the characters. The stage chemistry is genuine and emanates throughout the space. Barrie plays the role of Eva as both as an older and younger version. Her portrayal of an older Eva is a fascinating one as she embodies the character through her actions, her voice and the emotions that play over her face. Barrie creates a quietly strong persona that seems as though it could snap in an instant, knowing that she’s been carrying around secrets and guilt for years. When it does snap the emotion that’s let loose is so raw and unfiltered that it fills up the entire space. Murphy’s performance as Peter is lively and full of energy. He’s hungry with a curiosity to know about his family’s past and it drives him to push Eva to open up and reveal the truth. Eva flashes back to her earlier years where Barrie, Bozzuto and De Nicola are believable as a trio of old friends, discovering who they are and what they’re meant to be. What starts as fun and frivolity quickly turns to fear and anger, causing them to choose sides (or have sides chosen for them) during the Holocaust. 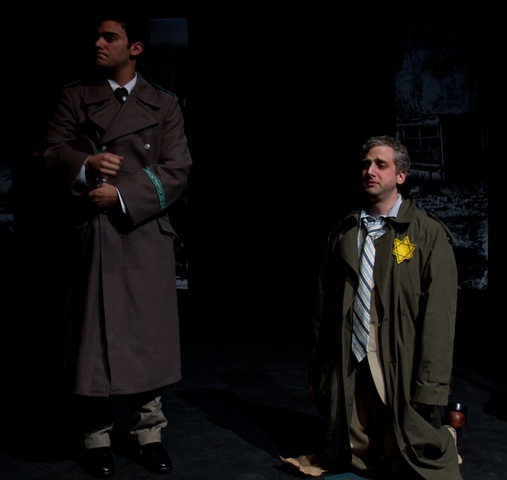 All three offer up captivating performances of friendships torn about by lines drawn between the Nazis and the Jews. The transitions between Eva’s story and Bashar’s story are smooth. Dardai plays Bashar also with a quiet strength as he stands up for not only his home but his family, his beliefs and his life. An unusual relationship is formed between him and Isaac (played by Samuel Buti). Isaac is torn between trying to help and simply carrying out orders. Buti’s performance shows this struggle through the formation of a relationship that could only happen under these specific circumstances. He’s clear in his devotion to the Israeli army but he’s humanized in his attempts at trying to ease some amount of suffering for Bashar. At certain times throughout the performance, whether it is from the intensity or excitement of the action, the accents slip out of German/Israeli/Palestinian into something less distinguishable. That being said, the performances grow to become so emotionally charged that they grab hold of the audience, captivating them so it’s impossible to look away as the ensemble digs down to the deepest point of authentic emotion. Memory plays at the Viaduct Theater, 3111 N. Western Ave., through December 18 Thursday through Saturday at 7:00 pm and Sunday at 3:00 pm. Tickets are $25 and $22 for seniors. Childhood is an existential crisis. Little ones ask their parents "why?" after any conceivable statement, sure that adults are omniscient rulers, who hold in their minds the secrets of life’s mysteries. The grown-ups, unable to answer questions like, "why does a car go? Not how, but why?" end up distracting kiddies with rules, especially rules about how rude and annoying it is to ask unanswerable questions. Our rules say, "be good, and good things will happen to you." Childhood lore tends to reflect and uphold these laws, good conquers, evil is defeated, and happiness reigns. Young adult novels, plays and movies rarely venture into areas of ambiguous morality, but those that do are rewarded with critical acclaim, and sometimes the promise of timelessness; such is the case with Robert Louis Stevenson‘s 1881 Treasure Island. 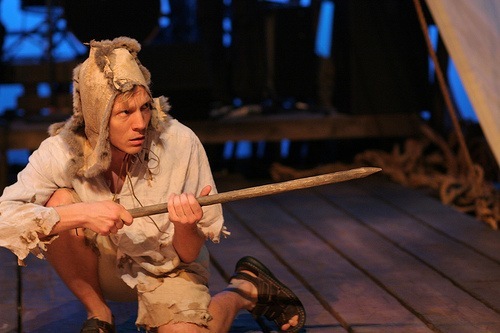 This is a tale that truly respects the emotional intelligence of children, and Adventure Stage Chicago‘s theatrical adaption of The Ghosts of Treasure Island doesn’t shy away from that. From the opening scenes of this thrilling play, the audience is confronted with themes of familial loyalty, regrets of old age and the beckoning call to youth to "make your mark" on the world. 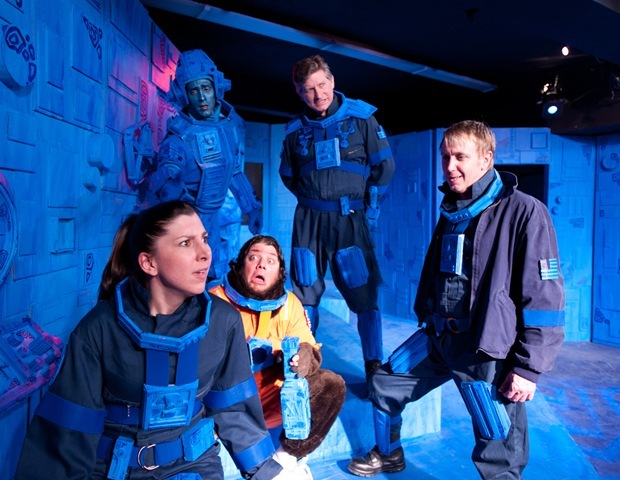 This is a show that – to steal Del Close‘s famous phrase – plays to the top of it’s intelligence. From the creative set designed by Chelsea Warren, which includes a beam which can be raised to transform a flat wooden floor into a pirate ship, to the artful adaptation by playwright Eric Schmiedl, who plays hard on the book’s themes of self-discovery and moral ambiguity. 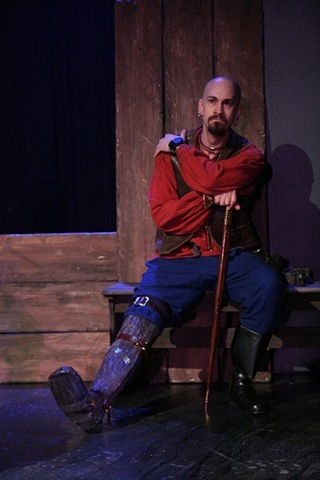 One of the most striking parts of the play is the performance of Glenn Stanton as the depressive alcoholic pirate Billy Bones, whose life of regret, and pathetic death serve as the inciting incident of this play. He is actually scary as the forlorn pirate, whose drunken state gives way to demented fantasies and violent, erratic behavior. 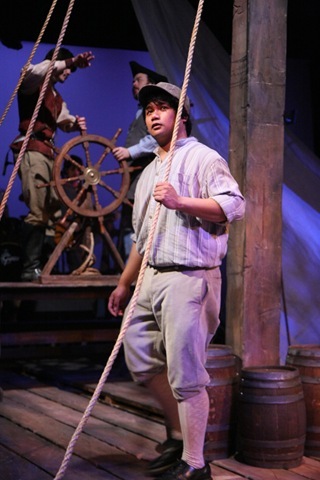 Jim Hawkins, played here by youthful Kroydell Galima, should have been played by an actual teenager, instead of an adult actor who can play young. 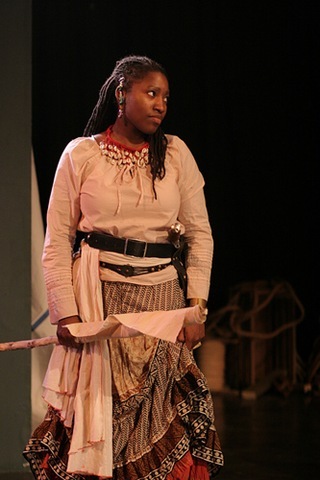 However, Galima is committed, intelligent and earnestly in touch with the emotional state of a child. 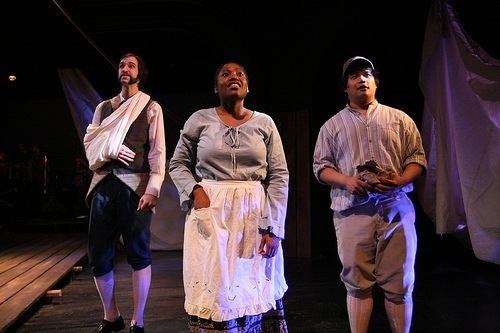 Punctuating scenes and major emotional shifts in this play is the pirate band Captain Bogg and Salty, who according to the program worked closely with the playwright in creating the adaptation. The music is dark and intense, and the lyrics are poetic. The band transforms a turn of the last century tale into a ballad rock musical, whose emotional intensity matches the complicated 129-year old story. 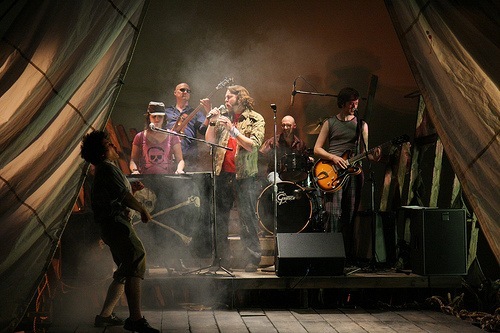 Ghosts of Treasure Island is a rocking adaptation that reveres the original tale. 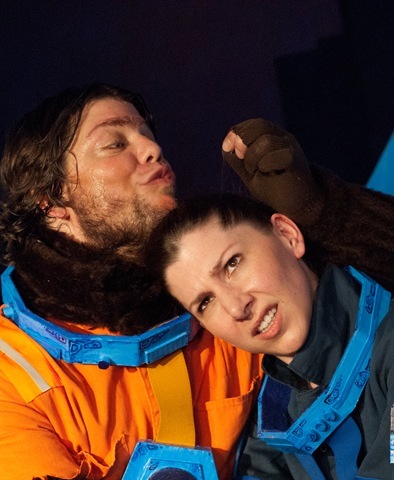 A perfect blend of childhood angst and modern day craft have made a near perfect children’s play. There are short comings, however. 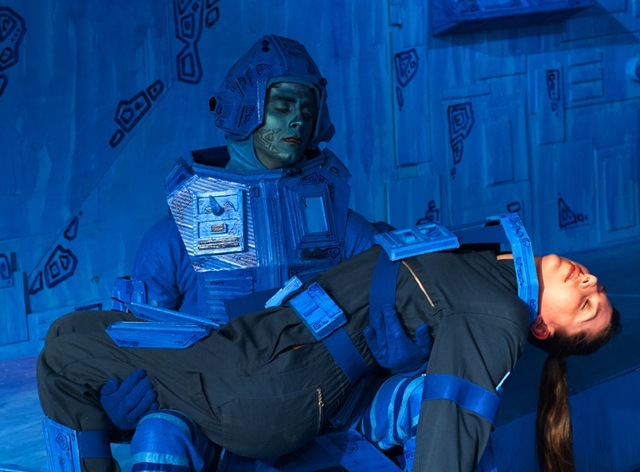 The play, which runs over an hour and a half may be a bit long for some young audiences. Additionally, this play has the potential to be too scary. It holds children to a high level, so make sure the little guys and girls you bring on board are up for an intellectual challenge and can handle the fear factor. In terms of raising the stakes of children’s theater, however, The Ghosts of Treasure Island truly hits the mark. Special Evening Performance: Friday May 7th at 7:00 p.m.
“Make no little plans” is a phrase coined by Chicago’s infamous urban planner, Daniel Burnham. 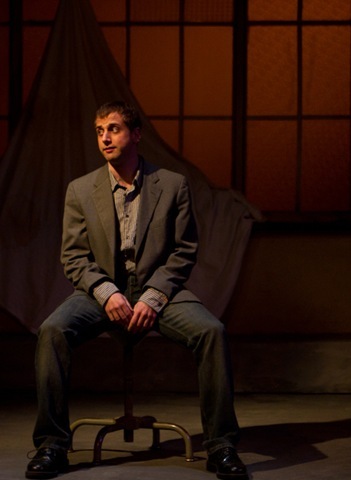 In Theatre Mir’s play Beautiful City, lead character Tony Raft embraces this philosophy despite opposition from his architect, a witch and the mob. 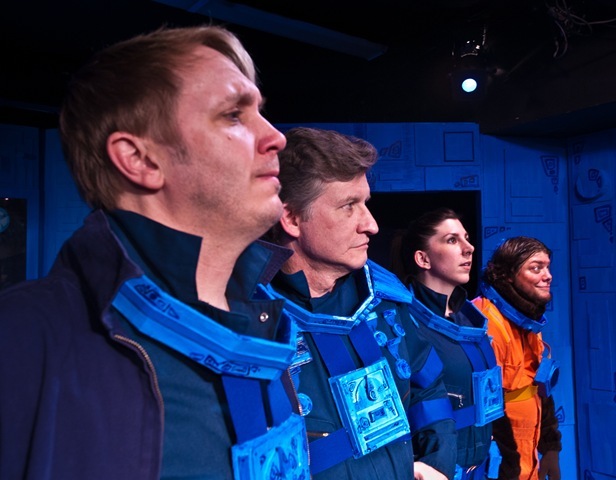 Performed at the Storefront Theatre in conjunction with DCA Theatre and the Chicago Department of Cultural Affairs, Beautiful City is the story of each person’s quest to get what they want by overcoming ‘the simple ugly truth.’ Tony wants a grandiose shopping mall. His mobster mama wants more money. His architect wants to be healed. The witch wants urban renewal and the freedom to dig through garbage. Beautiful City interconnects three families in an urban fairy tale of betrayal, greed and redemption. The entire cast has been solidly constructed. Here are some of the pillar performances: Yosh Hayashi (Tony Raft) impresses with his vigorous audacity over a shopping mall obsession. Splendidly rotten in Steep Theatre’s Hollowlands, Hayashi exploits the humor in his every diabolical depiction. It’s Gilbert Gottfried as Hannibal Lector. Walking up and down stairs in 3 inch heels, Rachel Slavick (Mary Raft) is tough. Except for a wonderful salad thrashing scene, Slavick plays it stone faced cold. Mira Vasiljevic (Gina Mae Sabatini) contorts her look with an ongoing skunk face in her portrayal of the witch. Physically and vocally, Vasiljevic showcases her character as a bizarre source of life’s truth. She’s hilarious! C. Sean Piereman (Paul Gallagher) is the one to be rescued in this modern day fable. In the first few scenes, Piereman’s pain is so uncomfortably real, one feels the need to call 911. Other high energy moments of dramedy are Jeremy Kahn (Stevie Moore) as a fast-talking punk, Kristen Secrist (Jane Sabatini) as a wacky hospital volunteer, Kurt Brocker (Rolly Moore) as a desperate thug and Megan Kohl (Dian Black) as the confident gum -chewing cop. 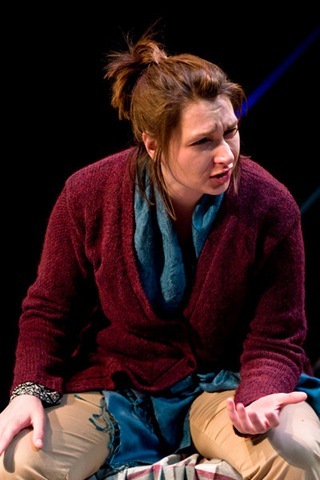 It is stellar acting wrapped up in Whitney McBride’s character-perfected costumes. Director Rob Chambers maximizes the physical space and the script to establish the framework of this adult fairy tale. Chambers is working from the foundation laid by playwright George F. Walker. Walker illustrates the issues of gentrification with an entertaining myth of mobsters verses witches. The parts are there for a solid built fortress. To nail it, Walker needs to sand it down for refinement. Some of the scenes are longer than necessary. In particular, a pivotal end scene is overly explanatory. This technique feels Hollywood-esque in “dumbing it down for the mainstream.” There are also some transitional moments of clunkiness, like, the scene where Paul is in the witch’s store. When did he decide to seek her out? It’s like realizing you are already in a room when you thought you were walking down a corridor. Walker’s blueprint needs a hallway connecting smaller rooms to more effectively imagine city dwelling. Nonetheless, even without a script renovation, Mir Theatre’s Beautiful City is an entertaining lesson of urban renewal for the entire community. Making his own contribution to our city landscape, Frank Lloyd Wright says, “eventually, I think Chicago will be the most beautiful city left in the world.” Right with you, Frank! 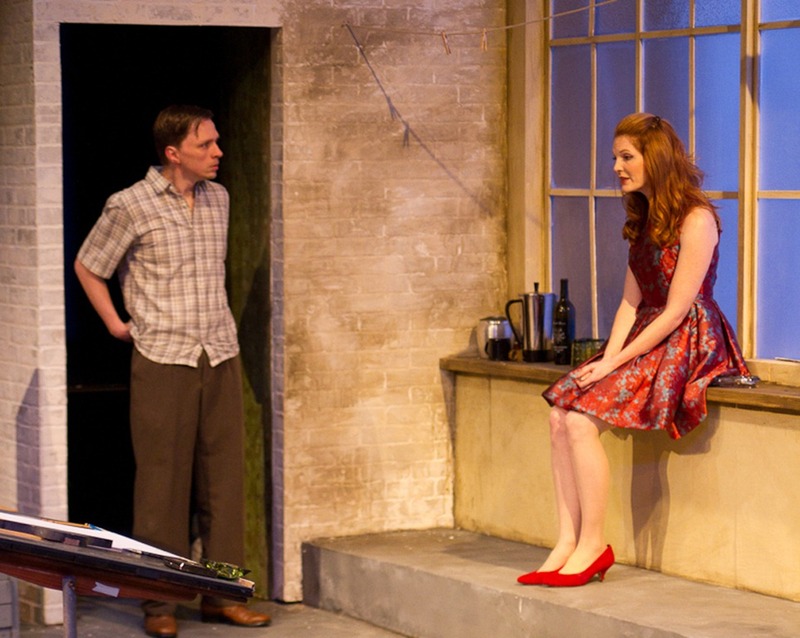 The success of Blackbird at Victory Gardens Theatre this summer has exposed Chicago to the work of Edinburgh born playwright David Harrower. 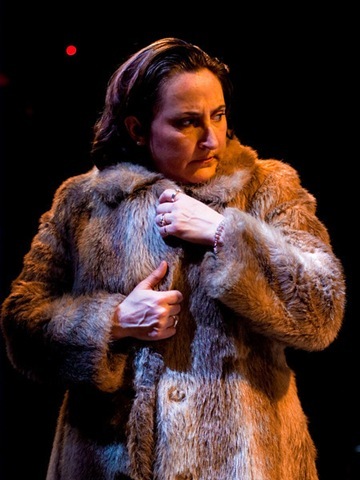 Kill the Old, Torture Their Young, onstage at Steep Theatre, is Harrower’s second play, which had its world premiere at Edinburgh’s Traverse Theatre in 1998, fresh from his breakout success with Knives in Hens (1995). “Kill the Old, Torture Their Young” is also the name of a song by Biffy Clyro, a Scottish alternative grunge band, which also had its beginnings in the mid-90s under the name Screwfish. Interestingly enough, Harrower bookends his play with monologues from a nameless Rock Singer (Derek Garner), commenting on modern alienation from an airplane in flight. But any connection between the two may have more to do with the 90’s explosion of Scottish culture than anything else. It’s not that the playwright might be familiar with Biffy Clyro; it’s that the band’s lyrics, too, are chockfull of the alienation and dislocation that inform Harrower’s central themes. Steep Theatre’s production dislocates Kill the Old, Torture Their Young even further, from its cultural and historical roots. Placing the action in America, the actors do not engage in Scottish dialect; nor is there much of a strong nod to the 1990s postmodern use of multiple narratives–experimentation that ultimately influenced major commercial films like Magnolia. Director Katherine Walsh’s choices would be more than excusable with a stronger cast, with better timing to pull off all the nuanced humor of Harrower’s writing. However, given the unevenness of performances and lack of a cohesive ensemble, this production loses its bearings in more ways than one. What also goes missing is daring punk/grunge energy that would better inform the rage of a character like Darren (Niall McGinty), a man whose thwarted ambition to become an actor results in otherwise inexplicable violence. Much like the Scottish novel Trainspotting, written by Irvine Welsh, made into a major motion picture, Kill the Old, Torture Their Young contains an underlying current of rebellion against alienating daily capitalist existence. That rage, unfortunately, goes largely unexploited and un-acted on in this production. Sadly, characters in this production seem to share only common resignation to the dreary, meaninglessness rhythm of their commodified lives. That being said, a few performances create interest. Jim Poole’s quiet and stirring portrayal of Steven stands out, as the manager who could film the city he loves better than Robert (Peter Moore), the famous documentarian hired to do the job. Nice moments are created between Robert and Heather (Julia Siple) in a hotel room together. 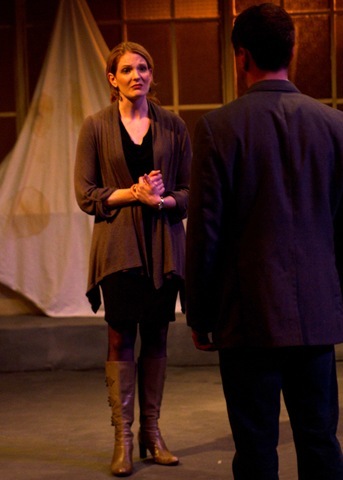 Paul (Leonard Kraft) and Angela (Bronwen Prosser) make a realistic pair of lost souls, who will likely stay together even if one doesn’t know what to do about the other. James Allen’s chagrined Birdwatcher and Patricia Donegan’s random Woman in Robes add badly needed humor and spice to the proceedings.